Boettcher Scholar competes on "The Amazing Race"
Floyd was determined to compete on the show ever since middle school when he first watched “The Amazing Race,” a reality competition show in which 11 teams of two race around the world, solving clues, navigating foreign countries and completing tasks. Each week, teams are eliminated, and the last team standing wins $1 million. But the minimum age to compete is 21, which gave Floyd years to plan his audition tape. In December 2015, Floyd, who is the drum major for University of Colorado Boulder’s marching band, convinced one of his band friends to audition with him. “I didn’t think anything was going to happen, but how could I not try?” recalled Floyd, lighting up as he remembers his bold decision. 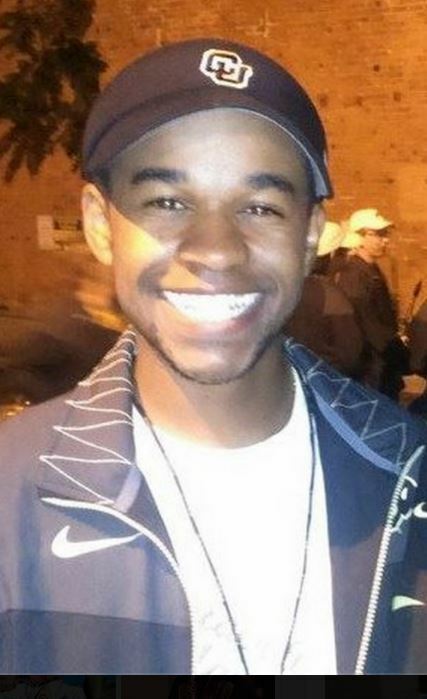 On March 9 the following year, Floyd received a call from a CBS casting director. For the first time ever, “The Amazing Race” was not accepting pairs. Instead, the contestants would be paired with a random competitor at the starting line. The next few months were filled with a flurry of paperwork, a new audition tape and a weeklong casting process in Los Angeles. Three weeks later, Floyd received another phone call. He was officially cast on the show. As soon as he hung up, he began training, which he says consisted of a lot of running. “I think running is the single most important skill you can have on The Amazing Race,” said Floyd. Floyd then had to pack for the cross-globe journey, with little guidance from the producers. “They tell you to ‘pack for anything,’” Floyd said. Contestants must carry their belongings with them at all times, but simultaneously be prepared for any possible task, weather or environment. Floyd needed to be prepared for everything, but pack minimally. He flew to the starting line in early June, but there was still the unknown element of who his partner would be. However, Floyd was not as worried about that as you might expect. 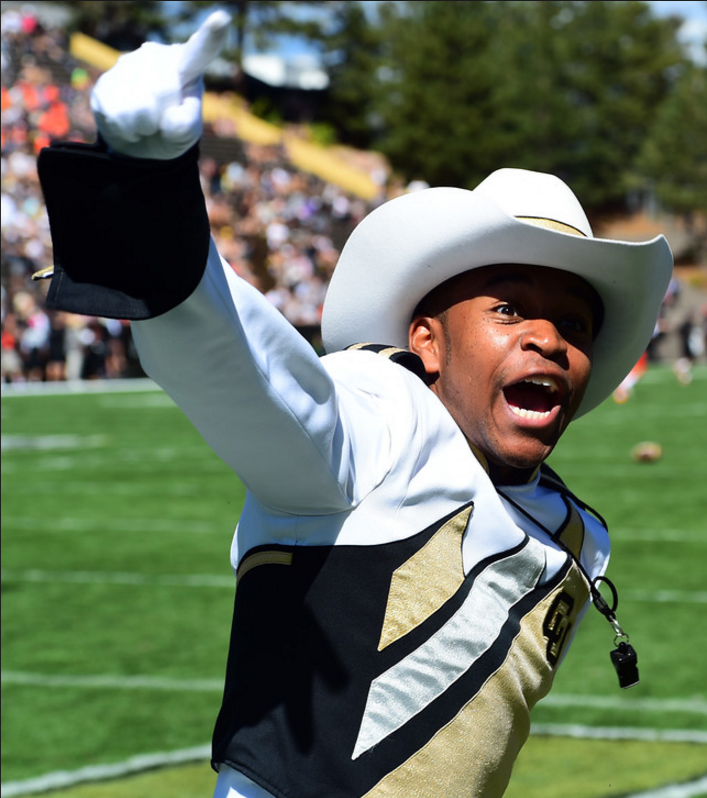 Floyd leading the CU marching band. At the same time, Floyd had seen the show before and recognized that they typically do not cast “22 reasonable, easy-to-get-along-with people.” For that reason, the nerves started to set in. The biggest challenges for Floyd during the taping of the show? Remembering that there were cameras on him constantly, and not letting self-doubt and negative comments creep in and affect his performance. “It’s easy to worry that you may do something embarrassing on camera and let that occupy all of your thoughts, but I had to remember that I was living my dream experience, and regardless of what happened—good or bad—I needed to enjoy the ride,” Floyd said. Being the youngest contestant and the only one who had never before traveled outside the U.S., Floyd said the other contestants thought that he would be the easiest to beat. Early on, he let that bother him, but quickly realized he needed to ignore the negativity and focus on his journey. Floyd cannot yet discuss the outcome of the show, but wants to use his own experience on “The Amazing Race” to inspire others to overcome their fears and try new things. His intent is not to become famous from the show, but rather to impact others in a positive way. In the true Boettcher Scholar-style of serving others, Floyd’s throwing a premiere watch-party with a fellow contestant from Boulder to raise money for the nonprofit, Big City Mountaineers, which provides outdoor experiences for underserved youth in Colorado. When he’s not appearing in prime time, Floyd is a typical, albeit high-achieving, college student. He leads the marching band, is majoring in economics and applied math and hopes to earn a master’s degree in data analytics and work to help companies create meaningful relationships with the people they serve. He even organized CU’s very own “The Amazing Race,” during homecoming, which received great participation and is becoming an annual event. To find out who Floyd is paired with and how far he makes it in the competition, tune in to CBS on Thursday, March 29 at 8 p.m. for the season premiere, then Friday nights for its regular time slot. Learn more about Floyd and his fellow contestants here: http://theknow.denverpost.com/2017/03/16/the-amazing-race-final-season-contestants-colorado/139259/.